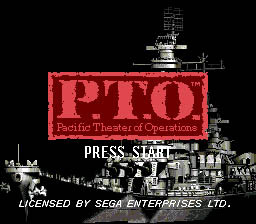 P.T.O. 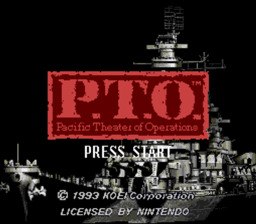 is a WWII simulation on the Pacific. Relive this theater of war by either taking the side of the Japanese or Allied forces. As Naval Commander, you may control as many as 16 fleets. With direct control over the #1 Fleet, formulate a winning strategy to fulfill your military objectives. Nine scenarios make up the entire Pacific Campaign with each one requiring specific goals for victory. Major battles at Pearl Harbor, Coral Sea, Midway, Solomon Islands, Marianas Islands, Philippine Sea and Okinawa are realistically simulated. Victory in one scenario will allow you to continue the game to the end. 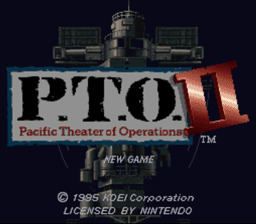 Ultimately, your goal is to either destroy all of the enemy's ships or occupy all 45 seaside bases. Air, land and sea operations are at your disposal. Orders such as a landing invasion or the bombing of a base can be part of your overall strategy. Rely on history proven techniques or develop your own. Whatever your strategy, make sure victory is on your side of the Pacific!